Cristhian Paredes is doing some very limber things here. Pivoting for the win. Atop the Western Conference of MLS going into the weekend action of June 2 and 3, two familiar teams sat atop the standings in Sporting Kansas City and FC Dallas - two perennial sides that have enjoyed recent success. Lurking just behind them is the surprise upstart club Los Angeles Football Club, followed by the Portland Timbers and Vancouver Whitecaps. With new personnel and a change in philosophy under Coach Giovanni Savarese, many insiders have been surprised how quickly the Timbers have adapted to a versatile, evolving style of play. It wasn't easy in the early months, but after losing in Orlando City to start April, the Timbers hadn't lost in six consecutive matches. 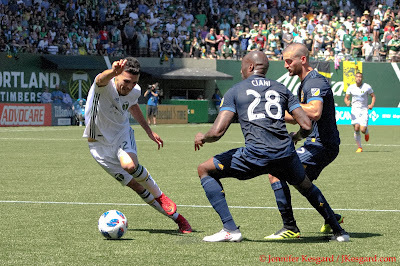 Match number 7 provided some familiar challenges with the Los Angeles Galaxy visiting on June 2 in a midafternoon tilt at Providence Park. 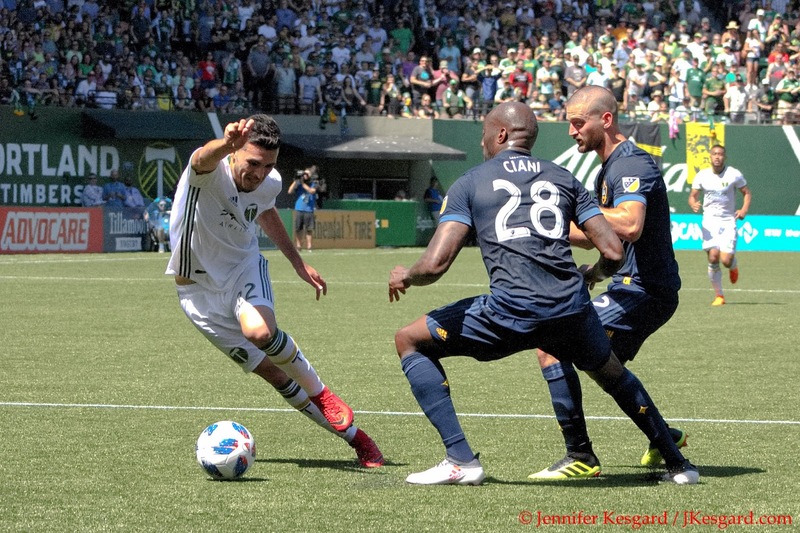 The two sides already faced each other back on March 4 in Los Angeles to start the 2018 MLS season, and while the Timbers lost 2 to 1, there were encouraging signs in a second half battle after they fell behind by 2 quick goals. In their second and final regular season meeting for 2018, both teams were dealing with thin lineup options - Portland had an extensive injury list with 2 players out on World Cup duty, while the Galaxy played midweek in FC Dallas. While the Galaxy struck first, it was the Timbers who rallied in the second half to earn a penalty, and the two goals would end up being the extent of the scoring as the sides played to a contentious yet equitable 1 all draw in front of another sellout crowd. Galaxy Coach Sigi Schmid has faced the Timbers several times over the seasons, and can usually craft a reasonable plan of attack for his charges. After their dreadful 2017 season, Schmid was tasked with sharpening an offense that lacked true scoring punch while keeping some of the defensive toughness that had been already in place. They struggled early to find an identity, but their complexion changed greatly with the early season acquisition of Zlatan Ibrahimovic to pair with striker Ola Kamara to give the offense balance. Zlatan has been everything advertised, but Schmid didn't have Kamara or both dos Santos brothers available as all 3 players were with their international teams for World Cup 2018. This forced Schmid to play slightly more conservatively with his lineup, putting lightning fast Emmanuel Boateng up top as a lone striker with 3 attacking mids: MLS veteran Chris Pontius, finally healthy Sebastian Lleget, and Romain Alessandrini. Former San Jose backstop David Bingham has taken over in goal for the Galaxy behind a rotating group of defenders, but Ashley Cole has provided some veteran experience while former MLS SuperDraft pick Perry Kitchen has returned to the league from overseas to give the Galaxy midfield some bite. Diego Chara was all over the pitch all day. Savarese was dealing with his own lineup questions coming into this match with Andy Polo (Peru) and David Guzman (Costa Rica) both unavailable after joining their sides for World Cup 2018. The injury list, however, made selecting a gameday 18 even more difficult especially with Timbers 2 playing later that day in Texas: Vytas, Jeremy Ebobisse, Jack Barmby, Alvas Powell were questionable while Roy Miller, Liam Ridgewell and Jake Gleeson were officially out. With Jeff Attinella making his sixth consecutive start in goal, he had to adjust to a slightly different defensive line with Zarek Valentin and Bill Tuiloma as the left and right backs with Julio Cascante and Larrys Mabiala the center backs. Since Polo was unavailable, Savarese promoted Andres Flores into the starting eleven with Cristhian Paredes and Diego Chara as the three defensive midfielders, thus putting the onus on Flores to replicate the success that Polo shows with moving forward on the attack. With Diego Valeri and Sebastian Blanco back as the attacking midfielders, the only question left for Savarese was who would be the striker - incumbent Fanendo Adi or the suddenly on fire Samuel Armenteros with 3 goals in 2 matches. The answer was Armenteros, but Adi would be available on the bench alongside fellow striker Foster Langsdorf, midfielders Eryk Williamson and Lawrence Olum, goalkeeper Kendall McIntosh, and defenders Marco Farfan and Modou Jadama. With the relative inexperience on the bench, it was important for the Timbers to avoid falling behind and chase the match. Under a very warm sun with Center Official Alan Kelly in charge, the Timbers got the first chance of the match just 4 minutes in when Valeri threaded a pass to Flores in between 3 Galaxy players, and it was Flores who got their first in space. Bingham came up big to stop the threat, but it was a huge early chance to take the lead. Boateng and Pontius would combine in the 11th minute as Emmanuel drove down the right side and put a cross in the middle to Pontius, who deflected the shot off the right post and out for a goal kick. The same two individuals would meet up again in the 20th minute off another pass to Pontius in space, but in this case, Mabiala and Tuiloma were slow to react and Pontius was able to spin a shot just inside the right post past Attinella for an early 1 to 0 lead. Portland has 2 awesome chances to level right afterwards - Blanco and Chara in the 22nd minute with Sebastian feeding Diego for the shot that Bingham parried away, and Tuiloma, Chara and Valeri in the 28th minute when Bill sent Chara forward with a lovely through ball. Chara dropped the ball back via a cross and Valeri put a great header on target, but Bingham was there for the save. Both sides traded back and forth chances with several blocked shots and near misses, but a battle royal was brewing between Kitchen and Chara in the midfield as both "destroyers" were creating mayhem throughout the pitch with hard fouls and well timed tackles. Bill Tuiloma showed his leaping prowess making the start at right back. The first half statistics showed very even numbers between Portland and Los Angeles in terms of game possession, shots, passes, passing percentage and duels won, but the Galaxy appeared to be more dangerous with their opportunities. The ball to Pontius for the goal was well timed by Boateng, but it was slow reaction from Mabiala and no reinforcement from Tuiloma that allowed the shot, although Pontius was helped with a deft touch to stop the ball in a place where only he could turn to recover it. 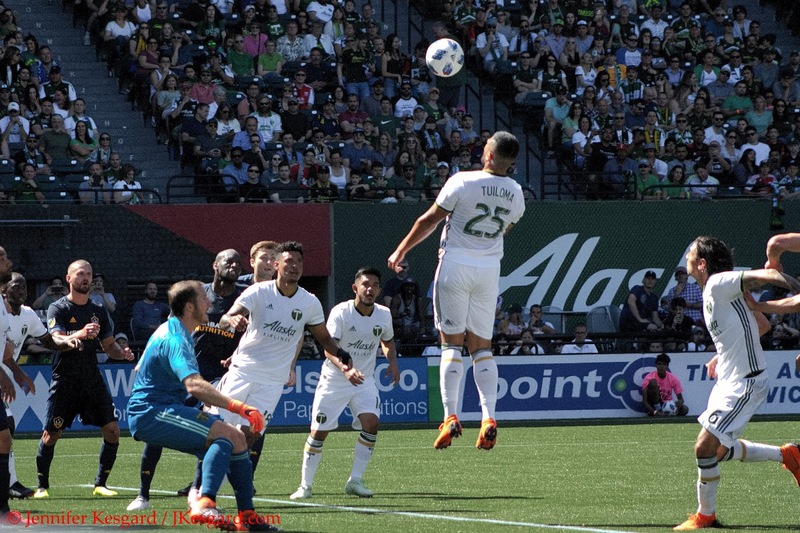 Armemteros, Blanco and Valeri were getting space to run at points, but the Galaxy defense bunkered down with each pending attack, which gave shooting lanes for Valentin, Blanco and Valeri to push forward distance shots. Getting the goal only aided the Galaxy attack to bunker, and their plan was augmented by Bingham, who was totally engaged and making huge stops in traffic. There were some concerns the Galaxy keeper injured himself in warmups as he left the pitch after a hard fall, but the effects of the crash didn't appear to alter his play one bit. While Savarese could make some adjustments to the Timbers to aid the attack, the fact was that outside of Adi, most of the subs were either defensive minded or very inexperienced players (or both). If this one was going to turn around, it would be because of the players already on the pitch. The Timbers appeared very determined when the second half began with Paredes, Cascante and Tuiloma all missing key shots in the first 5 minutes - Tuiloma's header off a Valeri free kick had some pace to it but it was right at Bingham for the easy catch. The tempo was picking up as the Galaxy started to push their pace, but in the 54th minute, Flores pulled off a nifty box to box run off a deft pass from Blanco that put Flores just inside the Galaxy box to the left. Galaxy defender Jergen Skjelvik came in to defend with fellow back Dave Romney in the area to try and stop Flores, but Skjelvik got his elbow up in trying to stop Flores with a shoulder to shoulder tackle, and Andres took a hard tumble in the box. Kelly wasted no time in pointing to the spot based upon the contact, and while the Galaxy put up some slight argument, they didn't protest much as Valeri stepped up to take the penalty. With a hearty smash into the left corner of goal past Bingham, the score was now level at 1, The Galaxy turned up the intensity for the next few minutes to see if they could regain the lead, but of the shots attempted, Kitchen's miss in the 71st and another Pontius close call in the 73rd caused some nervous moments for the Timbers defense. The final 15 minutes would see both teams try to break the deadlock, and Schmid brought Zlatan on in the 72nd minute replacing Boateng, while Savarese countered with a move to bring Adi on for Valeri to provide a two forward attack. However, the only credible attempts on frame in the final moments of the match were two headers by Tuiloma, the second one in the 83rd forcing Bingham to make a late reaction save to push the ball out for a corner kick. Savarese brought on Marco Farfan for Armenteros, and this led to one of the best moments of late stoppage time when Zlatan received a pass at midpitch and the young defender executed a wonderful tackle and deflection to strip him of the ball cleanly. 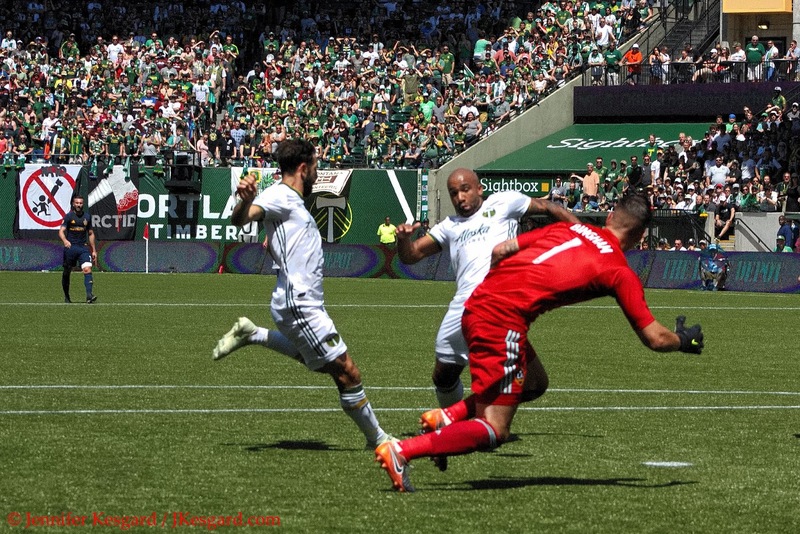 For their credit, the Timbers felt that they created several quality chances despite having a true winger in the lineup with Polo gone, but the final execution left something to be desired. 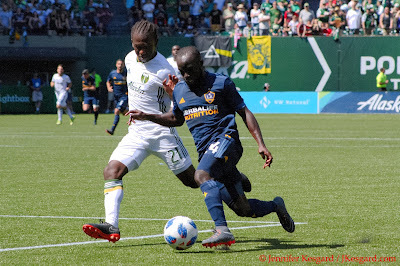 While I would agree with that assessment, I also felt that the defense played far too passively until the goal by Pontius and I was hoping for more cohesion; this could be due to the change in personnel, but the Timbers second half defense was much improved. For the Timbers, there were some individual highlights as Valeri, Blanco, Paredes and Mabiala continue their streaks in appearing in every 2018 Timbers MLS match, with Diego, Sebastian and Larrys starting every match (and Mabiala playing every league minute so far). Chara also became the all time franchise leader in games played for all Timbers eras with 215 appearances, but he will not get a chance to extend that streak in MLS play. Chara was whistled for 6 fouls by Kelly, and in the 62nd minute, Chara tackled Kitchen with enough force that Kelly gave the diminutive destroyer a caution for the foul. Unfortunately, this would be Chara's fifth caution of 2018, thus triggering the automatic one game suspension in league play - so Chara will not be available for this weekend's battle with Sporting Kansas City on June 9 at Providence Park. However, Chara could add to his total in the midweek U.S. Open Cup match when the Timbers host San Jose on June 6 at 7:30 PM, also at Providence Park, when MLS teams join the tournament in Round 4 in a single elimination tournament to crown the best U.S. based soccer team in professional and high amateur soccer. The winner of the June 6 match will play the winner of the other USOC match in this quadrant - the Seattle Sounders FC hosting the Sacramento Republic. The draw for hosting duties for Round 5 takes place on June 7 with those matches slated for June 19 or 20, which is mere days ahead of the Timbers resuming MLS league play with a 2 game road trip to Atlanta United FC (June 24) and Seattle (June 30).